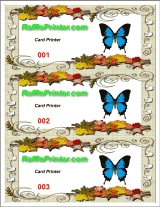 The 'Templates' Drop-down has many pre-set background templates for Swing Cards, Popup Cards, Envelopes, Flowers, Borders, Airplanes and more. These templates mark guide lines and colors on the background for cutting and folding. 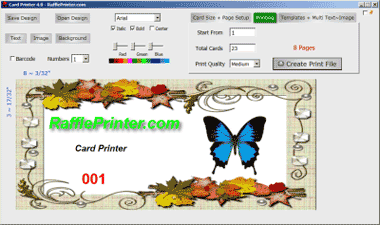 Choose a suitable card size and select from the drop-down to load the templates. For Borders, Ellipse, Flower templates etc, hold the Right CTRL Key down and select a color to shade the template. There are many free Card and Invitation Templates, Backgrounds and Borders on the web. To load a template or background image into the designer, right click the (full size) image on a web page and choose 'Save', then right click in the designer and choose 'Paste Image Background'. The image will stretch to fit the card size, and stay visible as you re-size. Or right click the image and choose 'Save Picture as' to save it locally to your computer, then hit the Background button or right click the designer and choose 'Get Background' and select the image you saved to load it. There are also lots of free Origami Templates on the web you can use as background templates to make your own personalized origami objects. To re-use designs for later Events, design 'Base' Items with text blocks and images, leaving out text and/or images relevant to individual Events (dates, values, prices etc) and save the design as a background image template. These templates can be re-loaded later, and relevant text and images added to create new Cards, Tickets, Invitations etc from the saved template 'Base' designs. Right click an empty area in the designer and select Save Background to save the templates to your computer. Hit F1 for Key Combinations to add background colors and gradients to your background. You can create templates (of the correct size) in any image editor and load them into the designer as backgrounds.